Here’s Style Arc‘s Juliet shirt being worn. This is an asymmetrical style with a front tie that is sewn into the side seam on the left and grows directly out of the front bodice piece on the right. It’s an interesting variation on a classic shirt. These photos were taken with it in its fresh off the sewing machine state, hence the relative lack of creasing. I really like this shirt. But at the same time I want to pull the pattern apart and change things to make it even better. For one, the back is unshaped and quite plain. I think it could do with some darts, and I’d like a yoke to break up the large expanse of fabric. I’m also not entirely convinced by the three quarter length sleeves. They look good in photos but I prefer full length. Incidentally this pattern runs very long in both body and sleeve. I have lengthened it, but not nearly as much as I normally would need to. Otherwise I’d say it’s true to size. The asymmetric tie was what originally drew me to the design but now I’ve sewed it up I find the conventional left side tie (the one sewn into the side seam) a bit unsatisfactory. It doesn’t sit as nicely as the right tie. Next time I’d do the left front as a mirror image of the right front piece with the grown on tie. That will use a lot more fabric; the pattern piece for the right front is so big you couldn’t cut it on the fold even on wide fabric. One other interesting little detail on the pattern is the stepped hem. The back is about 5cm longer than the front. I wasn’t convinced the difference was enough when I saw the pattern pieces; maybe it would look like a mistake! But I went with it and the effect is growing on me now. I’ve put the shirt with my silver jeans here, but I suspect it’ll go well with a wide variety of bottoms. It might even work tucked in? I will have to experiment. Thanks to my husband for taking the pictures. This dress seemed to take forever to make. I started it during the heatwave and with hindsight a cotton shirt dress with lots of fiddly details wasn’t the ideal project for weather that’s too hot to have the iron on. I got there in the end though. I’m hoping this will be a useful transitional dress that will work for autumn as well the summer. The pattern is a very classic shirt dress style: breast pockets, two piece sleeves with proper cuffs, and a hidden button placket. The pattern drawing on the Style Arc site is wrong, by the way. It shows a tab for rolling up the sleeve and there isn’t one; also the pattern has two buttons on the cuff and the drawing shows only one. I’m slightly surprised there’s no back yoke in the design. The back of the dress is extremely plain; the only detail is the centre back seam. The fabric is a wide (150cm) turquoise stretch cotton poplin from Tissu Fabrics. The pattern says it takes just under two metres which is pretty good for a long sleeved dress. I didn’t really believe the length estimate on the pattern and was quite prepared to buy more fabric if the pieces didn’t fit on the 2m I had, but to my amazement it was fine, even with my usual length additions. I had just enough left to cut a second pair of the breast pockets when my first pair went wrong but the rest of the scraps were so small they went straight into the bin. Those breast pockets are a tricky sew. The pocket pieces have rounded corners which you are supposed to press under, and it’s hard to do smoothly. I had most success when I made a cardboard template of the curves to press the fabric around but even so they’re a bit jagged. Another time I might line the pockets as making the curves would be a great deal easier and there would be less chance of burning my fingers. As well as the breast pockets there are inseam pockets on the side seams. The instructions are pretty minimal. They suggest making a plan in advance for which seams to topstitch but don’t actually tell you which ones to do. I definitely topstitched the wrong sleeve seam. You can only do the one you sew first, and I think it’s best to top stitch the one that runs into the cuff opening because by sewing that seam first you can do a much better job on finishing the cuff opening. Mine isn’t great because I sewed that seam last and I won’t be rolling the sleeves up on this dress as a consequence. Which is a pity, because I suspect they were designed to be worn with the cuffs turned back given how long the sleeves come out. Another thing I’d do differently next time would be to add some interfacing to the placket. It’s a bit wobbly in this fabric. It would probably be fine in something heavier. Will there be a next time? Possibly. It’s a pattern with very good bones but this particular version has a few execution problems that bother me; a more experienced sewist probably wouldn’t have had the same issues. The weather’s cooling down here so I probably won’t make another this year but I might revisit it in spring. Maybe in a bold print? Special thanks to my husband who managed to take the photos while simultaneously toddler-wrangling. This dress was an experiment which worked out far better than I expected. The pattern is Style Arc‘s Toni ‘designer dress’, which I’ve made twice before in very drapey fabrics as the pattern recommends. I loved both versions, but sadly neither fabric aged gracefully and both have now been thrown out. However I’d always suspected that the pattern would also look good in something crisp and structured. So here it is in white cotton sateen, and I think it’s the best version I’ve made yet. I’ve shortened the pattern 10cm from the original length as I found it’s much easier to walk in that way. Otherwise this is made up straight out of the packet in a single size; the fit is very forgiving. In previous versions I sewed weights into the drapes to keep them in place, but that wasn’t entirely effective. For this one I tried to encourage the drapes to stay put by tacking the seam allowances together in a couple of places. They still move about a bit. I think I’m just going to have to embrace that. I think I was trying to adjust the drapes in the picture below! The crisp fabric really gives the skirt some volume. This pattern is a bit of a fabric hog, but I got very lucky: a friend of my mum’s was destashing and passed on 3m of this sateen. It’s an unusually narrow width; only just over a metre; and I used it all. Thanks Sue! I interfaced the collar and facings with Vilene G405. I wondered if that was going to be too heavy but it worked out OK because you need something fairly supportive for the collar on this one. I also added strips of interfacing on the front pocket opening edge. I did some top stitching around the sleeve openings. The pattern just asks you to turn the allowances under there, but I don’t see how they’d stay put like that. I tacked the neckline facing to the seam allowances to make it stay in place but that could have been topstitched down as well. Of course the big question is how wearable it is. It has the obligatory pockets (built into the pattern so no need to add them) and once shortened it’s quite easy to move in. The colour isn’t entirely practical but it’s easy to wash. Only time will tell for sure, but I’ve worn it for a day at work this week and was happy with it. No pretty finished project photos in this post I’m afraid; in fact quite the opposite. This is my toile of Style Arc‘s Genevieve jacket. It’s a long line jacket with an asymmetrical closure and a collar I’m not quite sure how to describe. You know what, here’s the technical drawing. The suggested fabrics cover a huge range of possibilities: wool cashmere, boiled wool, ponte, brocade and linen. So in my mind that covers both stable knits and wovens, and goes all the way from fairly crisp fabrics (brocade) to floppy (linen). Hopefully that just means that the collar looks good no matter what the degree of drape. Not that it matters as I’m using none of these. My fabric is a mediumweight grey denim with a bit of stretch and an unusual brushed finish on the wrong side. I’ve made a few Style Arc patterns before and been very impressed with the drafting, but the patterns were all drapey sack dress type things that required next to no fitting. I don’t know how the more close-fitting styles come out. Style Arc have a reputation for having much less ease than Big Four patterns though, so I was expecting to make a bigger size than I do in Vogue. I did a bit of googling and found lots of people saying the size chart is accurate and in particular you should go with your shoulder width for picking a pattern size. Which put me two sizes down at the bust from what I expected and one size down from what I make in Vogue…it didn’t seem very likely. The hip and waist sizes I got seemed much more plausible. So for once I made a toile. I should mention here that my copy of the pattern is multisized so I could easily blend between the three different sizes I needed. If you buy Style Arc paper patterns direct from the Style Arc site you only get a single size in the envelope. Multisized paper versions are available through Amazon, but not in the full range of styles. Confusingly, you can also buy PDFs from the Style Arc site that come in your chosen size plus one either side. At least you have options! So here it is. Excuse the hem, I was way too lazy to pin up the hem allowance so it’s just folded and has dropped down in places. I did fold up the sleeve hems. And actually it’s pretty good. The front seems to fit well. The sleeve length is technically OK but I like my sleeves long so I’m adding a bit more. I need more room in the upper back I think; both length and a tiny bit of width. After rummaging through some fitting books I think a ’rounded back adjustment’ will do at least some of what I’m looking for. It means adding a shoulder dart. And if I wasn’t making this in a stretch fabric I think I’d size up. Everything on the toile matched up perfectly except in one place: the diagonal style lines were off by 5mm at the side seams. You can just see it below. I’m certain it wasn’t a sewing error but I may have messed up when making length adjustments. I’m honestly not sure how I did that. Anyway it’s easy to fix. I know I am now supposed to go and make a second toile to check I have all this right, but I don’t have the energy. Also I have run out of calico. So I’ve adjusted the pattern as best I can and now full speed ahead with the good fabric. Let’s see what happens. I don’t repeat patterns very often, but my first Stylearc Toni dress has been such a favourite that I made another. It isn’t a maternity style but it’s roomy enough to work over a bump without too much distortion. I’m trying to make regular patterns with plenty of room on them rather than maternity ones in the hope that they’ll still look OK after the baby arrives. My original version was made up straight out of the packet but this time I made a few changes. The first dress is a bad length for me: it ends at the widest part of my leg which means I can’t take long strides because the dress is very narrow at the hem and it catches on my calves. That was my fault for not bothering to add any extra length to the pattern. I normally need to add 2-4 inches to dresses. This one’s supposed to end at the bottom of the calf so it probably needed four inches adding if not more. I was a bit short of fabric for the second version, so instead of lengthening it to the intended proportion I shortened it by four inches so it ends just below my knee. I’m really pleased with the way that’s come out. It’s comfortable to walk in and it’s more flattering than my previous version. The fabric is a lightweight viscose woven from Macculloch and Wallis. Right now it’s still available here. It drapes very nicely, which is good for the style, but I used very lightweight interfacing on the collar to go with the fabric and that was a mistake as it’s come out a bit too floppy. This is the same fabric I used the pink colourway of for my first Vogue 1482 dress. It is very comfortable to wear and although it’s lightweight it’s relatively easy to sew. I lost the pocket piece from the original pattern and had to make a new one. Unfortunately I didn’t make it quite deep enough to be perfect. But any pockets are better than none. The position of the pocket is better on this version because I took out some of the length from the top half of the pattern, raising the pockets up a couple of inches. Here’s the back view. Last time I said that the centre back seam could be eliminated, but I’m glad I kept it. I had trouble fitting the collar to the neckline on this version – I probably stretched the neckline out while handling – and having the seam allowed me to fix the mismatch by taking the dress in a little at the top of the centre back. Clio made the great suggestion of adding a zip to the centre front seam for breast-feeding access. I increased the seam allowance on the centre front seam to half an inch (or 1.2cm; it was 1cm originally) and interfaced the seamlines to make inserting the zip easier. I also removed the seam allowance from what was originally the centre front seam of the neck facing pieces so I could use the all-machine method of applying facings to the top of the zip and neckline from Kathleen Fasanella’s centered zip tutorial. Here’s a closeup of the zip, which also shows the collar worn down rather than up. An unexpected bonus: because the only black invisible zip I had on hand was a 24″ one I can put the dress on by stepping into it rather than pulling it over my head. Since we took these pictures the weather in the UK has turned autumnal and I’ve been wearing this dress with leggings and my grey boiled wool kimono jacket. I’m hoping it will keep going all winter with enough layers. I can even see me making a third version of this one day; I’d like to try it in something really crisp like a cotton poplin to see what happens to those drapes. Remember the 80s? Big baggy tunic tops worn over leggings, a triangular silhouette, lots of lycra. This is the Style Arc Hedy dress, and it would fit right in there. For me it was love at first sight. Absolutely the best thing about this dress is that it has pockets cleverly integrated into the design. They’re standard inseam pockets but the way they are placed in the curved front seams means they hang very well and don’t mess up the lines of the dress. I made this in a shiny grey mystery knit bought on Goldhawk Road last year. I don’t know what you’d call it. It’s a fairly stable doubleknit construction but the hand is very drapey and slippery, and it’s shinier than most of the “scuba” knits I’ve seen. There was a lot of the stuff around at the time; I saw it in several different shops and lots of colours were available. It washes well and needs no ironing at all. It’s completely artificial fibre but I guess in the right light it could double for silk jersey. Come to think of it, this pattern would be amazing made up in silk jersey. Love those seamlines. Here’s a better look at the underlying shape. The dress comes in two lengths and this is the shorter, “knee-length”, version. I deliberately didn’t make any pattern adjustments so it is not a surprise that it came out pretty short – I normally add between two and four inches length to most dress patterns. I like the proportion as it is though. I think the pattern runs true to size although with so much ease it’s hard to tell. Anyway I made the size closest to my measurements rather than going down one as I do with Big Four. It’s a fairly easy sew. You don’t need an overlocker. I used mine for the side seams and to finish some edges because it’s fast, but the rest of the dress was constructed on my regular machine. I sewed the hems with a regular zigzag stitch because I was too lazy to fight with my twin needle and I wanted to wear the dress quickly. 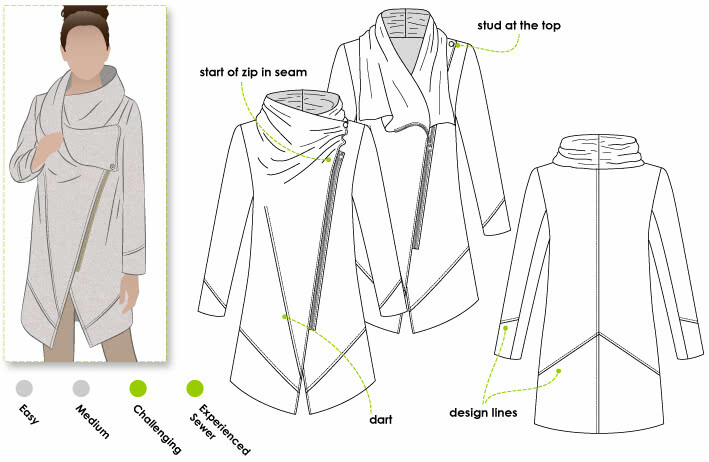 The pattern instructions are Burda-style minimal, although unlike with Burda there are diagrams provided for the trickier bits, such as folding the neckline pleat. I like that the instructions include interfacing everywhere it’s needed. I’m very impressed with the overall quality of the pattern. Everything matched up beautifully and the industrial-standard seam allowances used made sewing it easy and accurate. It has already passed the wearability test. I made it just before Christmas and it’s been worn about twice a week ever since. There may be another one of these soon if I find the right fabric.